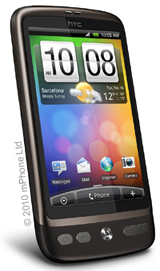 The large hi-resolution display on the HTC Desire SIM Free makes it perfect for watching movies. Support for popular movie formats and the brilliant 3.7" display utilizing the the latest AMOLED (Active Matrix Organic LED) technology to produce sharp vibrant colours and deep blacks. Everything you could desire for a business and entertainment handset. Buy the HTC Desire SIM Free for use with any GSM or 3G SIM card / line including all those on UK networks like O2, Vodafone, Orange, T-Mobile, Three and Virgin (pre-pay and contract).